Tuesday, March 7, 2017 7 P.M.
Today’s GFS is predicting a nice snowfall Saturday night (see below). Of course, a lot can, and will, happen between now and then. But it is exciting to at least have the thought that we still could have a good snow before the season ends. 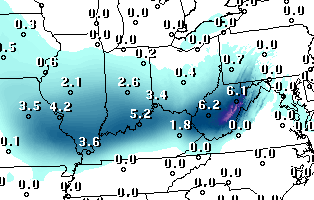 Unfortunately, the GFS stands alone at this time…the European model keeps the chance for significant snow north of us. Streetside parking meters are illegal in the state of North Dakota. Charity begins in the home…in this case. An 87 year old preacher and his wife run an on-line ministry as a “non-profit” organization. Last year they reported a net income for the website of 7 million dollars. Their combined salaries added up to $4 million. That reminds me of the old joke about what to do with the offering plate each Sunday. “i take the plate, throw it up in the air. God takes his share and whatever falls back down is mine.” Only is this case, it’s not a joke! This entry was posted in commentary, forecast, stuff on March 8, 2017 by wx. Yes, it appears that thunder and lightning will be visiting our area during the late night hours tonight. Also, the Severe Storms Center has us in a “slight” risk area for severe thunderstorms tomorrow. However no severe storms are expected with tonight’s rain/thunder/lightning. The situation looks like this: a weak upper air disturbance will float slowly over the Ohio Valley between (roughly) Midnight and Noon tomorrow. This system is starting to pick up some Gulf moisture and rain/thunderstorms are popping up over northern TX, AR, west TN and southern KY. Rain should become widespread over our area after Midnight and finally end around midday. Thunderstorms will be embedded in the rain shield with the best chance for thunder here about 5 A.M. to 10 A.M. Overnight instability will be low and the upper air dynamics, while good for an April/May severe weather situation, are actually pretty low for a winter system. As a result, I don’t expect any severe storms overnight or tomorrow morning. The dynamics aloft will have a hard time overcoming the lower level thermodynamics. A couple of weeks ago, a major change in the upper air pattern looked like a good possibility for North America for this month. The models were leaning toward temperatures being below normal for much of this month. That trend lasted several days, but since then has shifted back to the primary pattern it has shown much of the winter – cold and wet over the western states and warm and wet over the east. It looks well locked in, so not much hope for snow lovers. Bad winter in that regard. It was amazing to watch New England turn the tide and rally last night. You’ve got to give Tom Brady and the Pats credit for putting themselves to win the game, but to my mind, they NEVER should have won the game. Atlanta just outright “gave” the game away. With time running out, Atlanta had a second down with the ball in easy field goal range AND an 8 point lead. Keep the ball where it was. Run down the clock with a couple of runs – kick the field goal – game over – Super Bowl winners! But, wait! Somebody (I assume it was the offensive coordinator) calls a pass play that requires a deep dropback by the quarterback. Play starts, qb drops back and gets sacked. 13 yards lost – no longer in field goal range – Patriots get the ball back with a chance to tie the game. And, they did – then made it look easy in overtime. Whoever called that play must have thought he’d catch New England off guard. Seattle thought the same thing two years ago. Look where it got them. The popcorn you buy at a movie theater costs more per pound than a filet mignon. This entry was posted in commentary, forecast, stuff on February 6, 2017 by wx. Friday, January 27, 2017 4 P.M.
A weak upper air disturbance this morning brought us some flurries and a second one will bring us some more flurries for the evening rush hour. With temperatures safely above the 32-degree mark, no problems are expected. Cold weather should remain through the weekend with additional weak disturbances bringing additional periods of flurries. Finally, a much stronger upper air system will cross the area Sunday afternoon and evening. This is expected to upgrade the flurries to a period of light snow and/or snow showers. This morning the GFS and NAM were far apart on their portrayals of what the result will look like, but now the NAM upping its game toward the GFS solution. But, don’t get too excited – even the “stronger” GFS still keeps snow expectations below one inch. The current outlook for Sunday calls for some light snow/snow showers between (roughly) 3 P.M. and 8 P.M. This should not have much of an effect on surface roadways, but bridges/overpasses/etc. could get some slick spots. Snow accumulation should be light – anywhere from a dusting up to an inch. For Louisville, about a half inch seems likely. My post earlier this week has already proven me right and wrong. My long time conviction that long range prediction is a fool’s game has been proven yet again. But, my insistence to try it anyway is where I went wrong (probably). My idea that the cold air arriving this weekend would hold through next week will not happen – unseasonably mild weather will return for next week. Further, I said that some really cold weather should arrive around Super Bowl time – that part will probably hold, although it’s not looking quite as cold. The worst part of my “outlook” was that the below normal trend should continue through most of February. Sadly, that appears to no longer the case. Moral of the story: I should follow my own advice! This entry was posted in commentary, forecast on January 27, 2017 by wx. Saturday, August 13, 2016 11:45 P.M.
What a miserable week of forecasting we’ve been victimized by all week and the worst is still happening. Thursday and Friday the forecasts, aided by the ever-willing media hype made it sound like we were due for ark-building rains. Only one thing was wrong – the models had already backed off of the extreme rain forecast by THURSDAY. By Friday, the models had backed off the threat of heavy rain even more. It was obvious that heavy, flooding rains were out of the picture for today and Sunday. So, the NWS did the “obvious” thing – issued a Flash Flood Watch for Louisville area and southern Indiana. Today worked out just the way the models predicted – a few very light showers in the metro area with heavier rain over central Indiana. However, the Flash Flood Watch was expanded over a larger area Sat. morning…ever though the NWS forecast had reduced the chances for rain by about 20% or so for next 48 hours! A few showers are possible overnight, but very little, if any, rain is likely for Sunday and heavy rain Monday will stay far to our west. But, the Flash Flood Watch remains in effect through Monday. My advice to the NWS is pretty simple: Stop hyping a dead forecast…it died a long time ago. This entry was posted in commentary, forecast on August 14, 2016 by wx. As the major surface low pressure area moved right over the area this morning, we actually got a break from the heavy rain and even saw some sunshine with temperatures in the upper 50’s for an hour or two. Then, as the low moved northeast, the colder air on it’s backside dropped temperatures in a hurry…and the rain resumed. But, we’ve seen the worst of it now. Winds will start decreasing this evening and the rain, possibly changing to snow, will be diminishing between 7 P.M. and 9 P.M. After 9 P.M., light rain showers and/or snow flurries will be scattered around the area during the night. Whether we have rain or snow showers doesn’t make any difference. If it’s snow, it’ll melt on impact so there’ll be no accumulation – so it essentially makes a situation I like to call “white rain.” It has the same impact as rain. Temperatures should remain above freezing in the Louisville area, so traffic problems should be no worse than wet roads. 4-5 days ago the models were predicting a major cold air outbreak to hit the eastern half of the country this weekend. But, nature didn’t seem to get the message – in reality the cold air is pushing east rather than south. So, now it looks like a cold day tomorrow followed by warming Friday into the weekend. Not as warm as last weekend, but still very nice for late February. Note: I know some forecasts floating around include the possibility of up to an inch of snow (on grassy areas), but that idea seems to me to be a real outlier. This entry was posted in commentary, forecast on February 24, 2016 by wx.